Armchair with solid beech wood seat and backrest, removable upholstered seat cushion and steel sled base. Base finished in polished chrome, white, black or red. 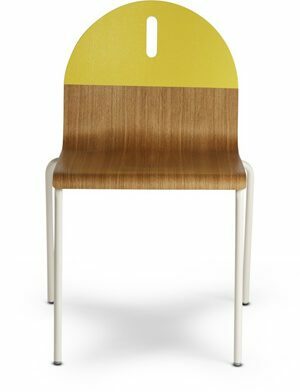 The wood lacquer color options (White, Red, Black, Sand, Basalt Grey, Cayenne Red, Dark Grey, Yellow Mustard) are available in both matte and glossy finishes.